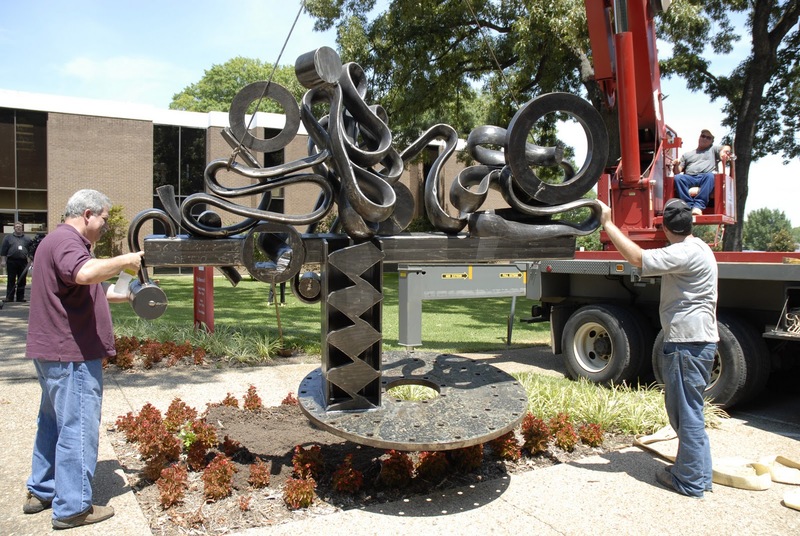 (TYLER, TX) September 4, 2010 – George Tobolowsky, the creator of the salvaged metal sculptures currently on view at the Tyler Museum of Art, will be on hand for a special Artist Reception & Gallery Talk, set for Friday, October 8 at the TMA, starting at 5:30 p.m. Guests will enjoy a reception held in the TMA Lobby, and then will follow the artist through a tour of Form & Substance: The Art of George Tobolowsky, on display in the Museum’s Bell Gallery and outside on TMA grounds. The event is free and open to the public. Participants may purchase the exhibition catalogue from the Museum Gift Shop, which Tobolowsky will sign following the Gallery Talk. “TMA visitors have been captivated by this exhibition,” said Ken Tomio, TMA Head of Education. “From the minute we completed the outdoor installation of several of his larger works, we have seen a steady stream of visitors coming through the exhibition, wanting to see more of these impressive pieces. Friday’s event will give visitors the incredible opportunity to observe the artist as he discusses his works from inside the exhibition.” Space is limited, and guests are encouraged to reserve their space by calling 903.595.1001. George Tobolowsky is known for his dynamic repurposing of discarded metal pieces into energetic and compelling large-scale sculpture. A Dallas native, George Tobolowsky earned business and law degrees from Southern Methodist University in the early 1970s. While there, he minored in sculpture and became life-long friends with his mentor, the renowned sculptor, James Surls. In the years following, Tobolowsky remained involved in the arts through personal collection and voluntary service to arts institutions, although his primary focus was on his corporate career. It wasn’t until 2006 that the distinguished businessman and attorney had his first solo exhibition at the Gerald Peters Gallery in Dallas. His work immediately captured the interest of the art world, and in the months following the exhibition, Tobolowsky began shifting his focus to life as an artist, exhibiting his unique works and creating new sculpture from his Mountain Springs, Texas studio, which is situated on his ranch. Works weighing up to 3,000 pounds have been placed in and around the TMA. This exhibition was organized by Grace Museum, Abilene, but the final selection of works at TMA vary from those shown in Abilene. In order to find materials, Tobolowsky visits metal scrap yards where he routinely picks up 1,000 to 2,000 pounds worth of raw material from vast heaps of discarded steel. The materials come from a variety of sources including machine and heavy-duty fabrication shops. These industrial castoffs are to some degree familiar to anyone who has observed a working engine or a large machine of some kind. Fan blades, gears, and coiling metal strips are transformed by Tobolowsky, who uses the materials to create works that are both familiar and foreign. Rather than constructing something that is a sum of its parts, Tobolowsky redefines form and function by building three-dimensional abstractions, often suggesting anthropomorphic postures, and succeeds in elegantly proving that the sum is indeed more than the parts. Substance & Form: The Art of George Tobolowsky is presented free of charge at the Tyler Museum of Art. Contributors are Kay Arms, and Barbara and Donald Zale. The TMA is supported by its Members, Tyler Junior College and the City of Tyler.